The popularity of craft beer has exploded in the past few years. In Edmonton especially, there are many restaurants serving locally produced craft beers and various interesting imports. However, there are still a lot of bars that only carry beers from big-name companies like Molson and Heineken. You usually have a choice between Generic Lager A, Generic Lager B, Generic Import Lager, and Guinness. If you're lucky, you might see Newcastle, the happy medium. Brown ales are characterized with their use of brown, medium-roasted malt varieties. English Pale Malt is typically used as the base, while crystal malt will usually account for 10-15% of the total grain bill. Chocolate malt may be added sparingly, while black and dark malts may constitute less than 2% of the total grain bill if used at all. 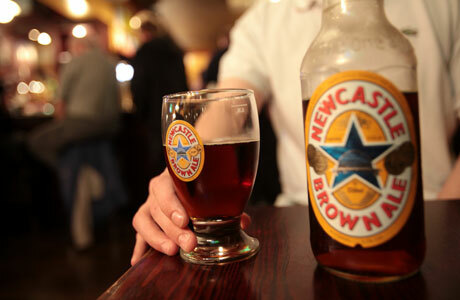 Newcastle Brown Ale is the most well-known specimen. Although the brewery was established by a third generation brewer in 1925, the company was bought by Heineken International in 2008. Though Newcastle is a nice change from the other big-brand lagers, there are many beers of this style available from craft brewers. Not only does your purchase supports a smaller company, it is likely to be far more delicious. For an authentic English brown ale, look to the oldest brewery in Yorkshire for an excellent Nut Brown Ale. The Samuel Smith Brewery was established in 1758, and still uses water from the original well, drawn from 85 feet below the ground. There are several fine brown ales produced on this side of the Pacific as well. Rogue makes Hazelnut Brown Nectar, brewed with seven different malt varieties and hopped with Perle and Sterling. Naramata Nut Brown Ale is one of Cannery Brewing Company’s most popular products, and is another excellent example of the style. 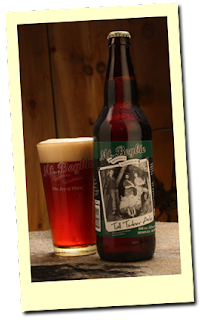 For the following recipe I used Tall Timber Ale from Mt. Begbie Brewery out of Revelstoke. The mountain in question is a named after Sir Matthew Baillie Begbie, the first Chief Justice of the Crown Colony of British Columbia. He earned the name "Hanging Judge" Begbie for his severe judicial rulings. “I should make something fast for dinner that doesn’t involve bacon and/or beer” is not something I often think, much less say out loud. Perhaps the thought “I have never made normal risotto before, much less a barley and beer concoction” should also have crossed my mind before I began this experiment. I sat down to dinner at 10:08pm, after carefully plating my creation. It was worth the wait. Beer, meet your maker. Barley. In a large frying pan, toast the barley kernels over medium heat until lightly browned. Remove from heat. Heat the olive oil in a large saucepan. Add bacon pieces and sauté until cooked through. Add onions to pan and cook for 3-5 minutes until the onions are translucent. Add the garlic and cook for another minute until garlic is fragrant. Add toasted barley to bacon and onion mixture. Cook an additional 2 minutes, stirring to coat. Pour in the beer and turn the heat up to high until the beer begins to simmer. Once the liquid begins to simmer, reduce heat back to medium-low. Add ½ cup beef broth and stir until the liquid is absorbed. Continue to add beef broth, ½ cup at a time. Repeat until all the broth has been added and the grains are tender with a creamy consistency. Heat remaining 2 tbsp olive oil and 2 sage leaves in a frying pan over medium-high heat. Rinse mushrooms and scrub gently to remove dirt. When sage begins to sizzle, place both Portobello mushrooms face down in the olive oil. Pour the balsamic vinegar and truffle oil onto the gills. When mushrooms begin to brown, flip and continue to cook for an additional 2 minutes. Remove the barley mixture from the heat and stir in parmesan cheese. Plate a cup of the barley risotto on each plate. Top with sliced Portobello mushroom and garnish each with a fresh leaf of sage. Note: You can use pearl barley for a smoother texture. However, pot barley has more fibre as the bran remains attached to the grain. If your diet is similar to mine, and encompasses a large quantity of bacon and beer, I’d recommend using the pot barley for the health benefits.